OJ Simpson, 70, signed his parole release documents in Las Vegas, Nevada last night to leave Lovelock Correctional Institution, after serving 8 and a half years locked up for a 33 year robbery and kidnapping sentence. He’s now finally out on parole, and was walked off the facility at a secretive time to minimise any media attention. He also added, “Nothing’s changed” and also “Give me a break here, please”. He will continue to live in Las Vegas due to his probation officer’s parole agreement, but it is said that he wishes to move to Florida in the near future. He can leave the state, but he has to give it time and remain be in contact with his parole officer to even gain the permission to do so. His parole agreement also states that he cannot smoke marijuana, even if he’s in a state where it’s legal, nor can he have a blood alcohol level greater than 0.8, which equates to about three drinks. OJ Simpson will most definitely be on the straight and narrow now that he’s free, and that’s not going to be too hard for him to maintain after being locked up for so many years. OJ Simpson went to jail for a botched robbery of sport memorabilia in Las Vegas in 2008, involving merchandise from his NFL playing days and a dispute that ensued over them, resulting in the crime for which he was charged. 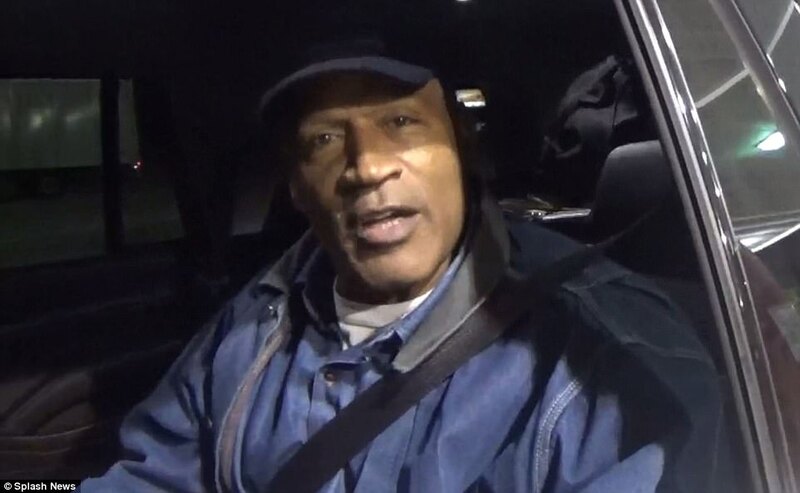 When the news media caught up with him in the SUV, this was the rundown of comments from OJ Simpson, who seemed in a relaxed mood, although he was surprised that he’d been followed: “Man, how in the world – have y’all been stalking me?” he joked. Simpson added, “I been in nowhere USA for the last nine years doing nothing. Nothing has changed in my life! What do you guys – I mean, what do you guys expect? There’s nothing changed”. OJ closed the window of the SUV after saying, “‘God bless, take care, you guys. Nothing’s changed”. His parole comes as a result of good behaviour and other factors such as gaining honourable credits whilst in custody. Could OJ be a changed man? The parole board and many people seem to think so, so perhaps his rehabilitation has been a success? At 70-years old, you can only wish him the best, but there are many that are still convinced that he’s behind the murders of his ex-wife Nicole Brown Simpson and waiter Ron Goldman on July 12th, 1994. However, as we all know, OJ Simpson was found not guilty of the murder charges and he was a free man. OJ Simpson’s lawyer, Malcolm LaVergne, told ABC News: “He wants to go to Florida, he wants to see his family and hug his family on the outside of prison”. OJ Simpson has 5 children that he hasn’t been able to see up close for almost 9 years now. However, he won’t be able to move to Florida anytime soon as the parole board won’t let that happen just yet. As part of the agreement, he needs to be monitored at his only registered home which is currently in Las Vegas. Seemingly, OJ will have to work on and for his Florida move. Last week, it was reported that there are many media outlets wishing for the exclusive OJ Simpson interview after his prison release, with Megan Kelly being just one of many pushing for the exclusive spectacle. At 70-years old, we hope that he can now enjoy what remains of his life. Much of his crimes remain a mystery, even though most are 100% sure that he murdered Nicole and Ron back in 1994, but with the courts stating otherwise, how can anybody be so sure? We will keep you further updated on any OJ Simpson news after his release from prison. We expect an exclusive interview with a major news outlet or media company to be reached in a few weeks time. Watch this space. The Juice is loose. Celebrity 33 year sentence, Florida Attorney General, Florida Attorney General Pam Bondi, I been in a car for the last five hours... how do I know how it feels?, July 12th 1994, Las Vegas, Las Vegas Nevada, Lovelock Correctional Institution, Malcolm LaVergne, Megan Kelly, Nevada, Nicole Brown Simpson, O.J. Simpson 1994, O.J. Simpson 1994 trial, OJ Simpson, OJ Simpson 33 year sentence, OJ Simpson 33 years, OJ Simpson acquitted, OJ Simpson interview, OJ Simpson interview 2017, OJ Simpson lawyer, OJ Simpson lawyer Malcolm LaVergne, OJ Simpson Lovelock Correctional Institution, OJ Simpson Malcolm LaVergne, OJ Simpson murder trail, OJ Simpson murderer, OJ Simpson October 2017, OJ Simpson release, OJ Simpson Release October 1st 2017, Oj Simpson released from Jail, Oj Simpson released from prison, OJ Simpson robbery, OJ Simpson robbery and kidnapping, OJ Simpson robbery and kidnapping sentence, OJ Simpson robbery trail, OJ Simpson Trail, Our state should not become a country club for this convicted criminal, Pam Bondi, Ron Goldman, The Juice is loose, The Juice is loose OJ released, The specter of his residing in comfort in Florida should not be an option, The specter of his residing in comfort in Florida should not be an option. Our state should not become a country club for this convicted criminal.